YOU know what the reality is: Smartphone companies get inspired by copy off each other’s design and ideas at times. But Philippine-based SKK Mobile takes the art of imitation to another level with what is said to be the SKK Chronos Era. Today, the company posted a teaser for its upcoming device on its Facebook page. It looks a lot like the Apple’s promotional image for the iPhone 7 Plus. Even the copy — “This is chronos” — is a rip-off of the iPhone’s “This is 7.” If SKK Mobile were as huge a manufacturer as Samsung, the Cupertino-based tech giant would most likely be suing it now. Anyhow, we don’t know what the specs of the SKK Chronos Era are. Only two things are confirmed as of this time, if we are to base it on the Facebook post: 1) that it has a dual-camera system just like the iPhone 7 Plus; and 2) that it will also be available in shiny black pearl, a variant clearly inspired by Apple’s jet-black option for its latest and greatest. However, our friend from GizGuide was able to obtain an alleged copy of the handset’s spec sheet. The Chronos Era is supposed to feature a 5-inch HD screen (not 5.5 inches, as some have predicted), 13- and 5-megapixel cameras (dual cameras or not? Now, we’re confused), and a 2,500mAh battery. It is claimed to have a 1.3GHz quad-core chip, 1GB of RAM, and 8GB of internal storage, which is expandable up to 64GB. It is likewise said to be running Android 6.0 Marshmallow. The SRP? P3,799, with what seems to be an introductory price of P2,999. If this is true, then the SKK Chronos Era is clearly a budget phone. Don’t expect it to be remotely built like the iPhone 7 Plus or its dual-camera lens to work as well as Apple’s big-screen device. But at least, there’s a cheap option for those who can’t afford a smartphone that costs more than P40,000. 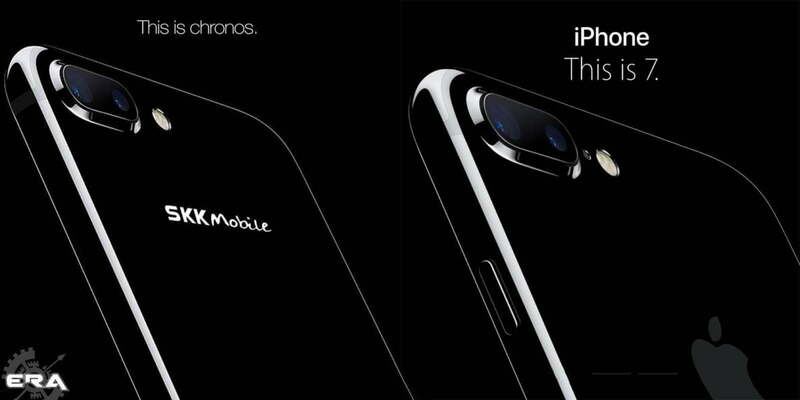 We just wish SKK Mobile hadn’t blatantly copied the iPhone 7 Plus promo material.